Click on the photo to enlarge and print. 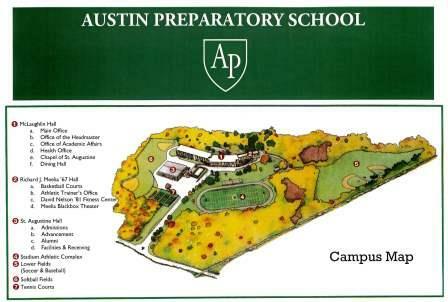 Austin Preparatory School is convenient to both Interstate 93 and Interstate 95 (Route 128). The school’s campus and facilities are located on 45 acres of beautifully landscaped property, just off Route 129, in the small town of Reading, Massachusetts. Take Interstate 93 to Exit 38 (Route 129). Take Route 129 East to the first intersection with lights. Take a right onto Willow Street. Austin Preparatory School is about one-third of a mile down Willow Street on the right, just after the railroad tracks. Take Route 128 South to the Route 129 Exit. Take 129 West (a quarter-way around the rotary). Follow through downtown Reading, and across Main Street (Route 28). After crossing Route 28, remain on 129 West until the next intersection with a traffic light (P&S Variety Store will be on your right). Take a left onto Willow Street. Austin Preparatory School is about one-third of a mile down Willow Street on the right, just after the railroad tracks. Take Route 128 North to Exit 36 (Washington Street). Turn left onto Washington Street, which will become West Street. Continue to the fork in the road. Bear right onto Willow Street. Austin Preparatory School is about three-quarters of a mile down Willow Street on the left, just before the railroad tracks.